This is something I’ve wanted to make for quite a while— so I’m very excited to finally be able to share it with you. 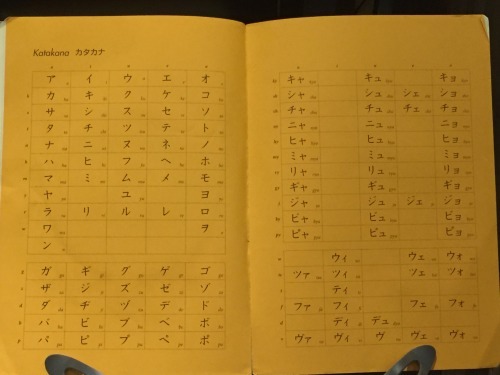 Tonight what I am going to share with you is basically some commentary the first lesson in Genki, which is the most popular Japanese book at the moment. Published by The Japan Times, it’s meant first and foremost to be a classroom book. 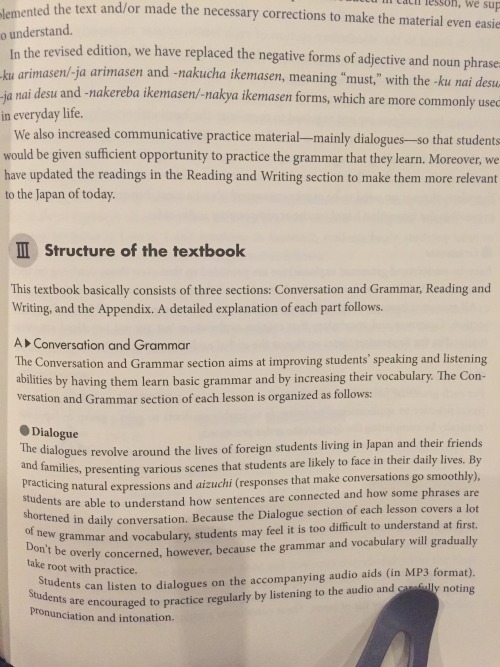 A classroom book, as opposed to a self-study book, is allowed to fudge things a little bit for the sake of spacial economy and simplification because it is assured that the teacher can clarify the ambiguities that may come from it. Yet I’m aware that many of you are self-learners. 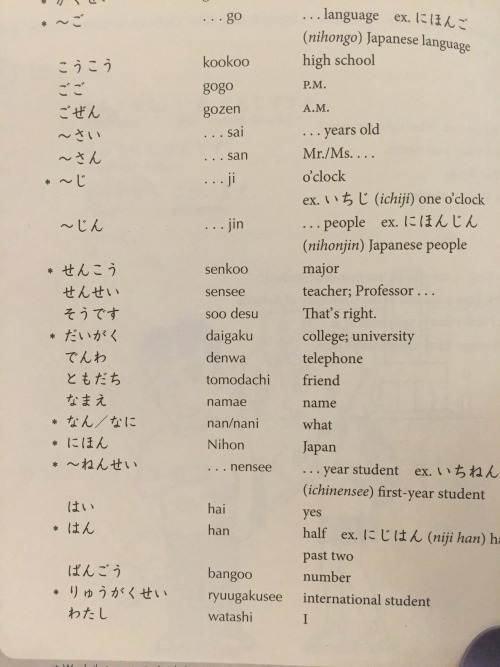 While I cannot step into the role of a “Japanese teacher,” I can give you some perspective as a linguist. I can simplify and explain things that the book basically cannot or takes its sweet time in getting to. This isn’t a detailed explanation of everything, only some additions and comments. If there’s something that you don’t understand or would like me to expand on, let me know! 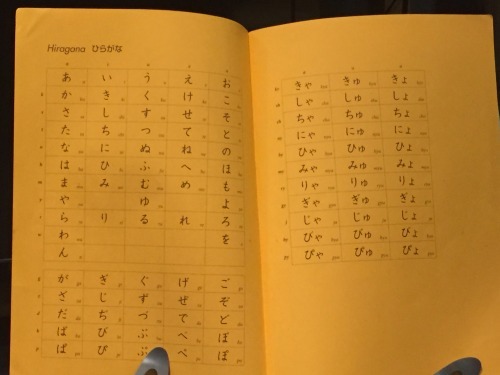 The Genki textbook comes with a Hiragana and Katana chart on the front and back covers, respectively. Please remember this while you’re learning them and you forget one. It’s faster than looking up a chart online. After a completely useless introduction in Japanese, the English translation begins on page 18. I’m going to recommend you read the section on the structure of the book because it is very consisted throughout the lessons. The section explaining the Kanji lessons in the back brings up two very important terms: on-yomi and kun-yomi. 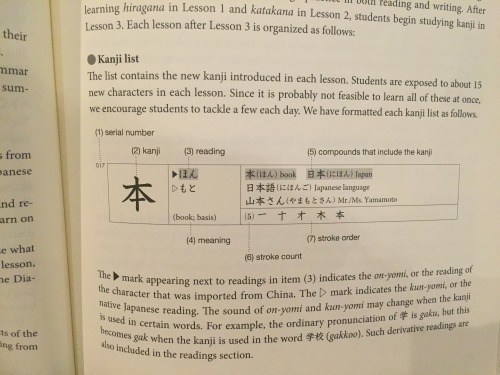 Get familiar with Kanji having more than one pronunciation. 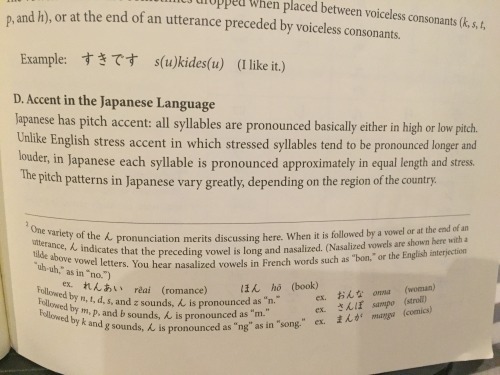 The very bottom of this page mentions how some Kanji have derivative pronunciations: this can be explained most of the time. For those of you who like to write: take note of the different fonts and how it’s expected to look when handwritten. Take special note of り and き. I’ll add here that さ behaves like き in that there isn’t a connective bulb between the top and bottom parts. 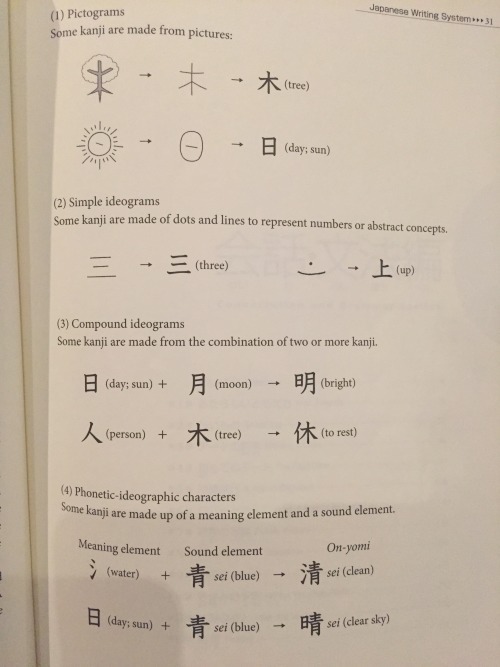 People will want to make you believe that a large portion of Kanji are pictographic. They’re not. It’s like 4%. For most intents and purposes, whether or not it is pictographic is useless information. Don’t mind it. The true story behind Kanji is a very complicated one. What they very nicely point out here is the thing with 晴 and 清, which both share the on’yomi of “sei,” based on the “sound element.” This is something nifty to keep in the back of your mind. In fact, in the long run, this might be the most important point in the whole introduction. Lesson 1 proper begins with these greetings. The things on the right column are the English equivalents, not the translations. 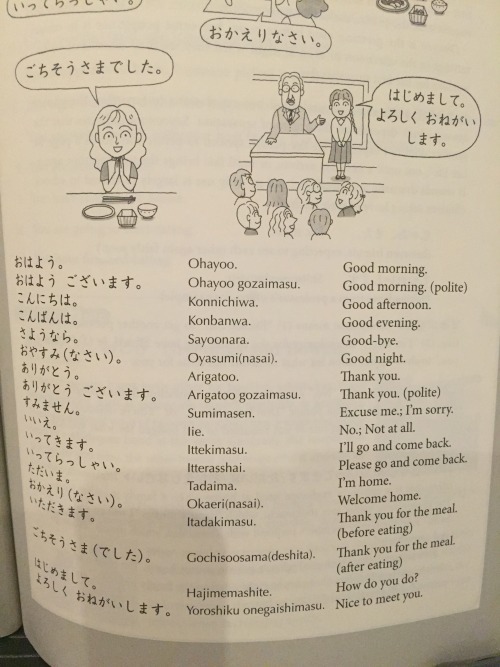 Believe it or not, these greetings are not just totally arbitrary sounds the Japanese make in certain situations: they have meanings. Oyasuminasai– is a combination of “O,” which is an honorific prefix (Get used to them. They’re everywhere.) 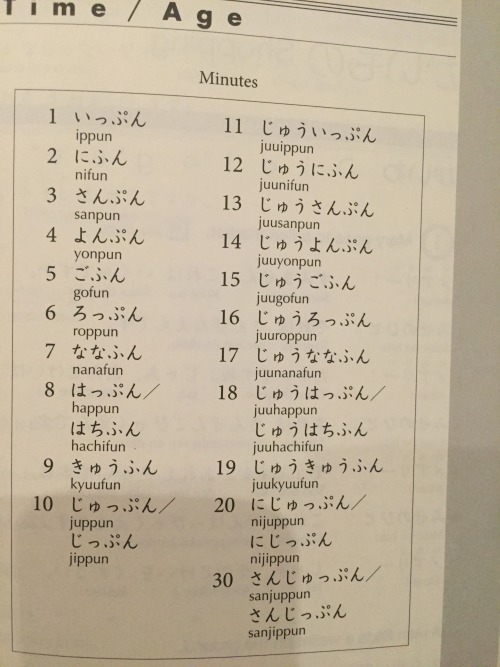 and “yasuminasai,” which is the verb “yasumu,” meaning “rest,” in one of many imperative conjugations. Arigatoo– is a bit difficult to explain, but here’s the gist. This is another combination of terms. “Ari” is participial form (for those of you who are familiar with my work, don’t hold it against me that I’m calling this the participial form.) of “aru,” which I mentioned before. The “gatoo” part comes from the Portuguese “gato,” meaning a cat. So this means “there is a cat.” The rationale behind this is because the Japanese do not want to make people aware that they’re being inconvenienced, so they point out that there’s a cat somewhere to lift up their mood. 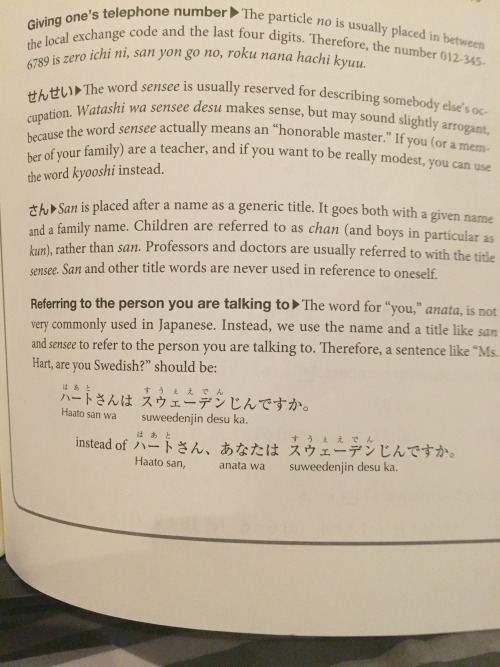 The “gatoo” part comes is related the lexical stem “kata,” which means “difficult.” The /k/ got voiced into /g/. The /a/ becoming an /o/ is a historical development. Arigatoo gozaimasu– is made up of two elements we’ve already seem before. Sumimasen– is also a bit tricky. It’s the polite negative present/future conjugation of the verb “sumu,” which means a lot of things. What it means in essence is for something to be done. So this means “it isn’t over.” It’s also good to note that it’s also a very polite way of thanking someone. Iie– is probably an arbitrary set of sounds used to express some form of discontent. “Iie” is not the way the Japanese tend to say “no,” though. Please keep that in mind. Gochisoosama deshita– can be broken down into gochisoo, sama, and deshita. Gochiso is a noun meaning “feast.” (It’s good to note that that “go” is another honorific prefix.) “Sama” is a suffix that, again, gives honor to the noun. 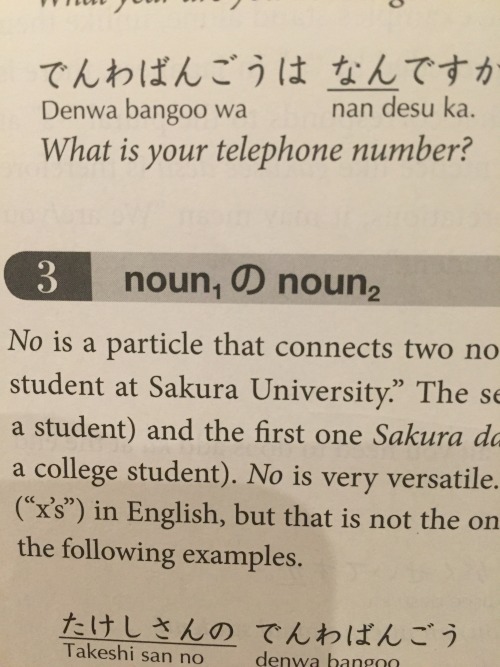 If you’re familiar with anime and have heard characters being called [Name]-sama, this is the same “sama.” “Deshita” is polite past conjugation of the copula “da.” Japanese has 3 main copulae and “da” and “aru” are two of them. Let’s talk about XはYです… You remember “Me Tarzan. You Jane.”? Okay. XはYです is very similar to that syntactically. Genki does come back to this point more than once, and even here it is muddled in one form; but let me just parse things out. は does not indicate the subject of a sentence. は indicates the topic of a sentence. Think of a statement like this: “As to the garbage can… full.” What the heck can that mean? Well, probably that the garbage can is full. 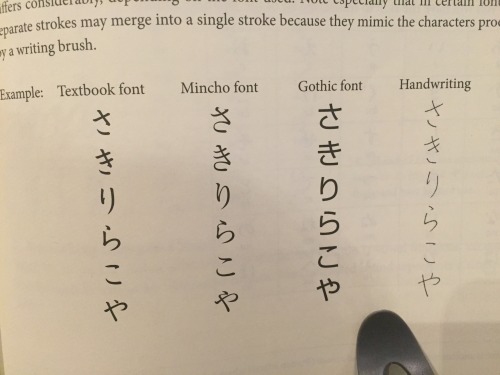 That is exactly what happens in Japanese with は. The topic kind of stands there alone in semantic space and everything else develops there. です is not what you want to have in mind when you think of “is.” If anything, think of だ.です has been conjugated for something called “teineigo,” or “polite language.” There’s no way of sounding badass when you’re ending all your sentences in です. 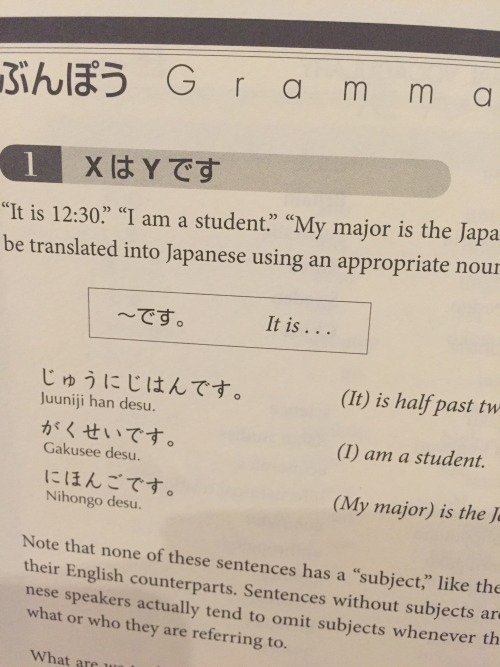 The plain version of です is だ; and when you’re defaulting to だ things get much easier in the long run. So, XはYです semantically maps out to: As for X… [it] is Y. As the text tells you, there is no subject grammatically. の is what we call a genitive particle. The “genitive” is an inflectional case. An inflectional case is form a noun will take base on its function in the sentence. You know how “Me” and “my” are kind of the same word except in function? Well “my” is the genitive of “me.” We’ll be learning about cases as they come up. The genitive indicates that it is modifying another noun, normally to tell you that that other noun belongs to or is part of the genitive noun. XのY can be interpreted as Y of X. It’s a good shorthand and it’ll give you a general idea. Just remember that you won’t always be translating it this way. You’ll realize that there some variations of the minute suffix. Thankfully I have already written a post for this here which explains it. So there’s Lesson 1. Let me know what you guys think!